In this section, we are going to talk about man-in-the-middle (MITM) attacks. This is one of the most dangerous attacks that we can carry out in a network. We can only perform to this attack once we have connected to the network. This attack redirects the flow of packets from any client to our device. This means that any packet that is sent to or from the clients will have to go through our device. Now, we know the password and key to the network, so we will be able to read just read those packets, modify them, drop them. This attack is so effective and so powerful because it's very hard to protect against. This is due to the way the ARP protocol works. ARP has two main security issues. The first security issue is that each ARP request response is trusted, so whatever our device says to other devices that are in our network will be trusted. If we tell any device on our network that we are the router, the device will trust us. It will not run any test to make sure that we are the actually the router. In the same way, if we tell the router that we are someone else on the network, the router will trust us and will start treating us as that device. So that is the first security issue. The second security issue is that clients can accept responses even if they didn't send a request. 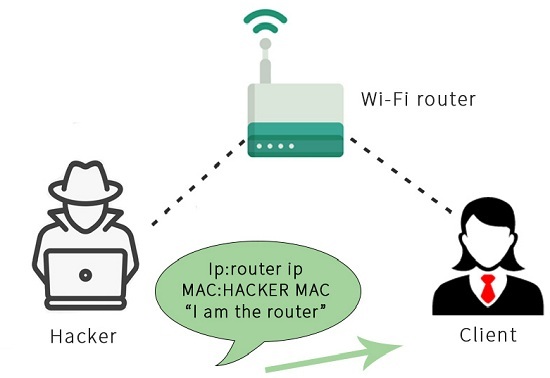 So, when a device connects to the network, the first thing it's going to ask is, who is the router? And then the router will send a response saying "I am the router." Now, we can just send a response without the device asking that who the router is. We can just tell the device we are the router, and because the devices trust anyone, they will trust us and start sending us packets instead of sending the packets to the router. Now, all this is done using packets. So, what we are going to do is we're going to send an ARP response to the Client so that we can send responses without the Client asking them. The Client didn't ask for anything, but we can still send it a response. We're going to say that our IP is the router IP. So, the router has the IP 192.168.0.1. 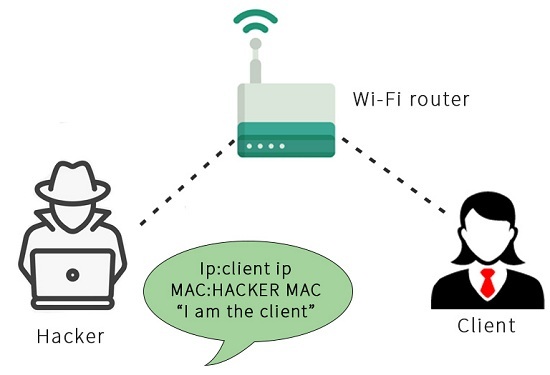 We're going to tell the Client that the device with the IP 192.168.0.1 has our MAC address, so we're going to tell the Client that we are the router, basically. 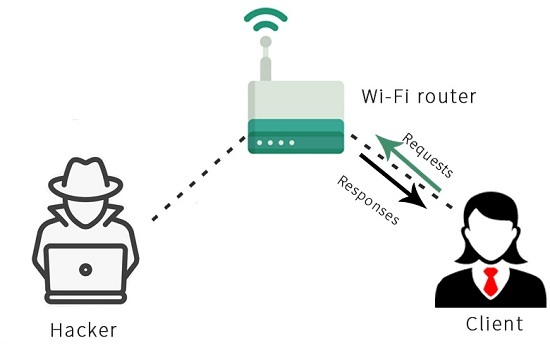 As seen in the following diagram, when the Client wants to open Google.com, it will send the request to our device instead of sending it to the Wi-Fi router. 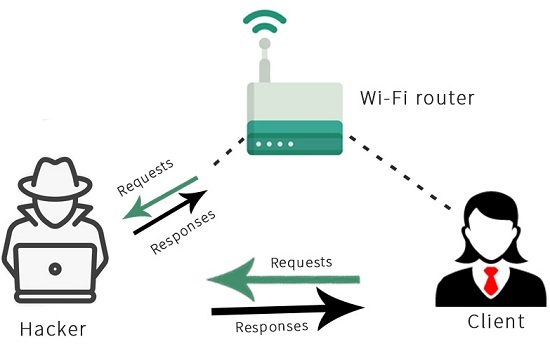 Now, the Wi-Fi router will send the response Google.com to our device instead of the Client, and then we will send that response to the Client. So, this means that each packet that is sent to the Client or from the Client will have to go through us. Since it is going through us and we have the key, we can read these packets, we can modify them, or we can just drop them. So, that is the basic principle of the ARP poisoning or MITM attack. Basically, we are going to tell the Client that we are the router, and then we are going to tell the Wi-Fi router that we are the Clients. This will put us in the middle of the packet flow, between the Client and the Wi-Fi router. After this all the packets will start flowing through our device, so we can read the packets, modify them, or drop them.